If you’re upping the protein in your diet with the hopes of peeling off pounds or maybe even gaining lean muscle mass, don’t make this protein mistake: eating too little at breakfast and too much at dinner. National nutrition surveillance surveys show that most American women eat, on average, about 10 grams of protein at breakfast (men eat about 15 grams) compared to having about 30 grams of protein at dinner (men get about 45 grams at dinner). What’s more, breakfast is the meal most likely to be skipped, which is a missed opportunity to benefit from the appetite supressing benefits of protein. Studies show that protein-rich breakfasts that have around 30 grams of protein stimulate satiety hormones, peptide YY and GLP-1 more than breakfasts with the same calories but high in either fat or carbohydrates. At the same time, protein-rich meals are more effective at keeping ghrelin (the hunger hormone) lower compared to carb- or fat-rich meals. 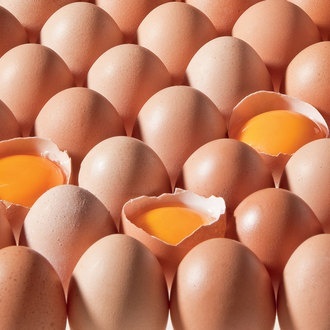 A study with men recently found that eating eggs and toast at breakfast resulted in eating 331 fewer calories compared to when the mean ate equal calorie breakfasts of cereal and milk and toast (high-carb) or croissants (high-fat). Eating about 30 grams at breakfast, lunch and dinner will help keep your appetite in check, moderates blood sugar and insulin levels and also helps to ensure that if you’re trying to optimize lean body mass. New research published in the Journal of Nutrition reported a 25% increase in muscle protein synthesis when protein is divided into three, 30-gram doses at breakfast, lunch and dinner compared to eating the same protein divided as follows: 11 grams protein at breakfast, 16 grams at lunch and 63 grams at dinner.What’s more, after a eating a breakfast with 30 grams protein, muscle protein synthesis was 30% higher compared to when subjects ate 11 grams protein at breakfast. For protein-rich breakfasts, here are some of our favorites. For more about protein in your diet, check out this post. Leidy HJ1, Ortinau LC, Douglas SM, Hoertel HA. Beneficial effects of a higher-protein breakfast on the appetitive, hormonal, and neural signals controlling energy intake regulation in overweight/obese, “breakfast-skipping,” late-adolescent girls. Am J Clin Nutr. 2013 Apr;97(4):677-88. doi: 10.3945/ajcn.112.053116. Epub 2013 Feb 27. Fallaize R, Wilson L, Gray J, Morgan LM, Griffin BA.Variation in the effects of three different breakfast meals on subjective satiety and subsequent intake of energy at lunch and evening meal. Eur J Nutr. 2013 Jun;52(4):1353-9.